The corrugated sheet roll forming machine 840 has a specific design, because it can bend both a corrugated sheet and 840 model flat sheets. Moreover, the rotation to the synchronized gear boxes is provided by hydraulic motors. 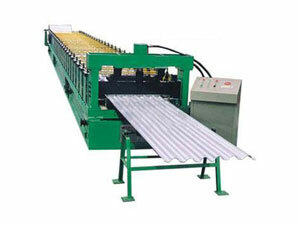 The corrugated sheet roll forming machine 840 is widely used in many places, such as garden-style factories, scenic travel spots, hotels, exhibition centers, villas, civil construction and so on. 19. One set of equipment includes: forming machine, hydraulic station, computer, hydraulic cutter, computer controlling system, counter, cutting system, material feeding support. 16. One set of equipment includes: roll forming system, forming press system, hydraulic system, computer controlling system, counter, cutting system, material feeding support. 19. One set of equipment includes: forming machine, hydraulic system, computer controlling system, counter, cutting system, material feeding support. Yingkou Changsheng Steel Structure Project Co.Ltd is a professional manufacturer and supplier of corrugated sheet roll forming machine 840 in China. Apart from corrugated sheet roll forming machine like roof panel roll forming machine, glazed tile roll forming machine, etc. we also offer auxiliary equipment products like automatic tube bending machine, plate bending machine, etc; high pressure polyurethane insulation painting machine including low pressure polyurethane foam machine and high pressure polyurethane foam machine; k-span machine, like automatic building machine, ultimate building machine and arch style buildings forming machine. With good quality and affordable price, the products produced by our company has exported Germany, Holland, India, Indonesia, New Zealand, Syria, United Arab Emirates, Russia, Kuwait, South Africa, and Bangladesh. If you are interested in our products, please contact us for details.